This is definitely an experimental recipe... one that ended up tasting great, but, trust me, looked a bit funky. I got introduced to Ube in the form of ice cream from Mitchell's Ice Cream here in San Francisco. I was ready to finally try an Ube cupcake recipe, so I went to Pacific Super, an awesome Asian grocery on Alemany Street not too far from where I live, and bought nearly everything Ube. I reconstituted Ube powder per the instructions on the packet, but didn't like the taste very much at all. I boiled and mashed some fresh purple yams and they tasted much better. It was an easy decision to skip the powdered and go with the fresh. The yams were a deep purple blue, which was great, but when mixed with the yellow egg yolks and other ingredients, the batter ended up a ghastly green. Maybe a little red food coloring would have balanced it out. On the other hand, I can say that the ghastly green is natural! Maybe a half cup of smashed beets might do the trick, if anyone cares to experiment even further. One definite keeper for me is the topping of peanuts crushed with a good amount of salt. This is something I stole from a caterer friend. The salty-sweet taste is very satisfying. 2. Crack eggs into a large bowl. Beat with a whisk until yellows and whites are combined. 3. Gradually add sugar and whisk until combined. 4. Add oil and whisk until combined. Add chopped macapuno and vanilla and stir with a wooden spoon to combine. 5. Sift together flour, baking powder, baking soda, and salt in another bowl. 6. Add about a third of the flour mixture to the wet mixture and mix to combine. 7. Add about one half of the buttermilk and mix to combined. 8. Repeat above, alternating flour and buttermilk and ending with the flour mixture. 1. Boil the water in a medium saucepan (I used the water from the yams). 2. Add the balls to the boiling water and boil for 30 minutes, stirring occasionally. 3. Turn off heat and let the balls steep in the water for another 30 minutes. 4. Transfer balls to a sieve and rinse with cool water to remove starch. 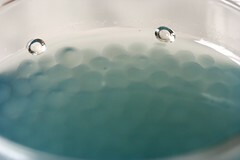 Transfer to a bowl and cover with cold water until ready to use. 5. Beat butter in an electric mixer until soft. 6. Add 3 cups of the sifted sugar and beat until combined. 7. Drain tapioca balls and measure out 1/2 cup. Fold into the frosting. 8. Add remaining sugar, 1 cup at a time, stirring until combined. Note: This frosting was very soft and almost looked a little curdled. It definitely has a not so pretty texture, but it tasted fine. The tapioca balls are a novelty and perhaps not necessary. There is the added interest of the chewy texture, but I am not sure it’s worth the sacrifice in the visual appeal. If you are looking for something picture perfect, definitely skip this recipe. It needs work. 1. Pipe frosting onto cooled cupcakes. 2. Crush about a 1/3 cup of unsalted peanuts with about a teaspoon of salt. Sprinkle over cupcakes. I wonder if playing with the pH of your batter would affect the color (oh... just now checkin gyour link:like in your red velvet cake experiments)? making soda flavored cupcakes would be a fun run of plays too (Yum- I'm thinking Big Red!). I never dreamed of ube cupcakes, you are one very creative baker! The green colour was initially somewhat shocking, but it's not that offensive. It could be a little surprise for everyone who takes a bite! I love that color! In Paris we have the "pomme de terre Vitelotte" which is purple too, but it seems we can't find purple yam... anyway I think it should be possible to try a potato cupcake don't you? Thank your for this recipe! i'm from asia, and i think ube is spelled as ubi here. You know, I quite like that green colour. It's not too yellow-ish greeny, which would be really sickly: perhaps it wasn't quite what you were aiming for but hey, maybe you could develop the theme. Are there any green things which would have a complementary flavour? I have never tasted ube, so I can't think of anything myself! You have such amazing and creative ideas and recipes. I have to make Ube Cupcakes...I love things that are weird and unexpected colors. Looks interesting, though I don't think I've seen a place in the Davis / Sacramento area (farmer's markets included so far this season) selling Ube. I suppose the mutant coconut I can scour a few places for. Seems like most of you are open to the green color as well! Like PJ im from the Philippines too and ube is a popular flavour there. I miss it quite a bit because you can't get it everywhere here in Sydney. What an awesome idea to make ube cupcakes though, im just thinking of the taste and its making me drool. garrett just pointed me to your site and WOW, what a TREAT!!! 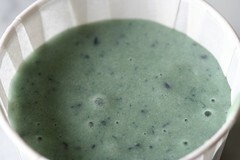 i love the end result of your green ube cupcakes! very fun! I'm from the bay area, Filipino and love Ube. Thank you for trying this recipe! I emailed you awhile back to ask you if you'd tried these flavors (macapuno, ube) and so excited to see you did. I can't wait to try out this recipe. Thanks! one of the above posters mentioned the ph level of your batter. i bet this is it. i know that blues in nature are very unstable colors...they cook out right away. I added buttermilk (which is acidic) partly for that reason. I think that could come into play, but I also think its simple color wheel stuff. Egg yolks are very yellow and there were four of them in there. The ube is blue-purple. I have to believe the yolks were a factor. In addition, every recipe I saw used food coloring, I am assuming to compensate for this. It would be easy enough to test if someone was planning to make these. One idea might be to reverse ingredients: maybe a macapuno cake, with an ube frosting. Ube halaya (ube jam) could probably be incorporated into a frosting while still maintaining its natural gorgeous purple color and its strong ube flavor. miss cupcake - you could totally use taro. i am fairly certain it would work fine. i am not sure about the mutant coconut. i think you could skip it (i barely noticed it in the recipe). is there another frosting that you could suggest?? I can't seem to find tapioca balls anywhere!! Unless I buy bubble tea and save the balls!! =) I love your blog BTW!! Am I supposed to drain the ube and then mash it?? My batter looks a little thick??!! chockylit??!!!!! !!!!???!?!?!?!!! !?!?!?!?!?!?!?!?!?!?!?! & !!!!!!!!!!!!!? 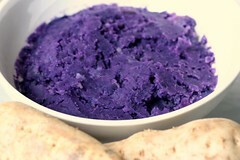 you should be draining and mashing the ube. my batter wasn't very thick. are you sure you measured out everything correctly? you can completely skip the tapioca balls and you will end up with buttercream, which trust me, will be fine. like i mentioned in the post, the tapioca balls are purely gratuitous. Sigh, Mitchell's Ice Cream is one of the things I miss about SF. When we lived in Glen Park we were down there practically every week in the summer. I just found your blog--ery cool. I have a question for you--I noticed that you use soufle cups for cupcake papers. Could you please tell me what size you use? Thank you! 3.25 ounce for the regular size. ¿Qué te puedo decir? Son increiblemente maravillosos! Estoy fascinada con todas tus recetas y estoy por comenzar a hacer los de zanahoria con naranja. Felicidades!! Muy buen trabajo! ¡Gracias! Me adulan. Y buena suerte con los cupcakes de la naranja de la zanahoria. Hi! 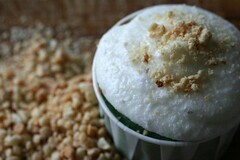 This is actually a very common Filipino dessert. Filipinos have ube cupcakes and ube cakes in their dessert repertoire. You may be able to do better by omiting the ube powder all together, and using ube jam. You can get this at Filipino or other Aisan stores. THis will make your cake very moist. Good luck! 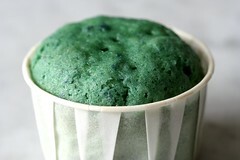 the martian green cupcake of yours is really hilarious (in a good way)... don't give up! I am into cupcakes recently have been logging back to your blog so often. It is really an inspiration to me. Keep up the fantastic job. Regarding the Ube, I had the same encounter as you did. I made some muffins and was shocked that the Ube turned green immediately on being added to the batter. After baking, I was contemplating whether to eat them as they look like Incredible Hulks in disguise. I threw every single one out without tasting them. Yup it is definitely the pH. I did a test of mashed Ube with baking powder and bicarbonate soda. Both samples turned a ghastly green.